What a lovely film this is, so gentle and whimsical, so simple and profound. 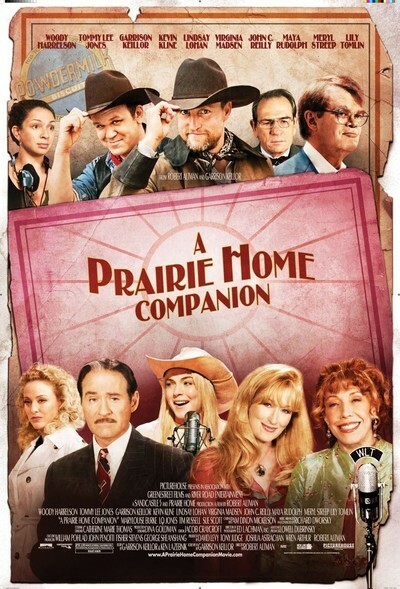 Robert Altman's "A Prairie Home Companion" is faithful to the spirit of the radio program, a spirit both robust and fragile, and yet achieves something more than simply reproducing a performance of the show. It is nothing less than an elegy, a memorial to memories of times gone by, to dreams that died but left the dreamers dreaming, to appreciating what you've had instead of insisting on more. This elegiac strain is explained by the premise that we are watching the last performance of the weekly show. After a final singing of "Red River Valley" (the saddest of all songs), the paradise of the Fitzgerald Theater will be torn down so they can put up a parking lot. After 30 years, the show will be no more. The show is hosted by a man referred to as G.K., and played by Garrison Keillor as a version of himself, which is about right, because he always seems to be a version of himself. Keillor, whose verbal and storytelling genius has spun a whole world out of thin air, always seems a step removed from what he does, as if bemused to find himself doing it. Here his character refuses to get all sentimental about the last program, and has a dialogue with Lola (Lindsay Lohan), a young poet who likes suicide as a subject. It seems to her G.K. should offer up a eulogy; there is sufficient cause, not only because of the death of the program, but because a veteran of the show actually dies during the broadcast. "I'm of an age when if I started to do eulogies, I'd be doing nothing else," he says. "You don't want to be remembered?" "I don't want them to be told to remember me." So the last show is treated like any other. In the dressing room, incredibly cluttered with bric-a-brac and old photos, we meet Lola's mother and her aunt, Yolanda and Rhonda Johnson (Meryl Streep and Lily Tomlin). They are the two survivors from a four-sister singing act: "The Carter Family was like us, only famous." Their onstage duets are hilarious, depending on a timing that rises above the brilliant to the transcendent; they were doing this double act on the Academy Award telecast last March. We also meet Chuck Akers (L. Q. Jones), an old-time C&W singer, and Dusty and Lefty (Woody Harrelson and John C. Reilly), two cowboy singers who threaten to make the last program endless as they improvise one corny joke after another. We also meet the people who make the show work: The stage manager Molly (Maya Rudolph), and, borrowed from the show itself, the makeup lady (Sue Scott), Al the backstage guy (Tim Russell), the sound effects man (Tom Keith), the bandleader (Rich Dworsky) and the P.H.C. house band. Molly is surely so pregnant she should stay calm, but she is driven to distraction by G.K.'s habit of never planning anything, and moseying up to the microphone at the last conceivable moment. Adding another level is the materialization in the real world of Guy Noir, Private Eye (Kevin Kline). Listeners of the program will know that Keillor and his stock company perform adventures from the life of Noir, as a salute to old-time radio drama. In Altman's movie, Noir is a real person, a broken-down gumshoe who handles security for the show (he lights his cigarettes with wooden kitchen matches, just like Philip Marlowe in Altman's "The Long Goodbye"). Guy is visited by a character described as the Dangerous Woman (Virginia Madsen), who may perhaps be an angelic one. The final visitor to the Fitzgerald theater is Axeman (Tommy Lee Jones ), who represents the investors who have bought the lovely theater and will tear it down. He doesn't recognize the bust of a man in the theater's private box, but we do: It is F. Scott Fitzgerald, that native son of St. Paul in whose honor the theater is named. A little later, Ed Lachman's camera helps Altman observe that Fitzgerald and Guy Noir have profiles so similar as to make no difference. Like the show that inspired it, "A Prairie Home Companion" is not about anything in particular. Perhaps it is about everything in general: About remembering, and treasuring the past, and loving performers not because they are new but because they have lasted. About smiling and being amused, but not laughing out loud, because in Minnesota loud laughter is seen as a vice practiced on the coasts. About how all things pass away, but if you live your life well, everything was fun while it lasted. There is so much of the ghost of Scott Fitzgerald hovering in the shadows of this movie that at the end I quoted to myself the closing words of The Great Gatsby. I'm sure you remember them, so let's say them together: And so we beat on, boats against the current, borne back ceaselessly into the past.